I went to see Nick and Norah's Infinite Play List which I thought was pretty good. I knew that it was based on a young adult book and I decided to go on the hunt for a copy. Unfortunately the only choice I had was the Movie-Version cover. Sometimes I'm really annoyed by this. Often this is the only version that you can get if you want to buy a new version of the book. I usually hold out and try to find a used copy with the original cover. However I have to say that the lack of cool cover (although Michael Cera is adorkably cute) was trumped by the picture spread in the middle. Seeing that glossy spread at the center of the book brought back memories. You see I was one of those dorks who read the Movie-Novelization. I was too young to know any better. At the time I thought it was cool to see the same story in another form. I got the opportunity to gain insight into what characters were thinking. Oftentimes there were parts of the movie that had been cut out for whatever reason. I didn't know at the time that these were just lame attempts to capture more of my dollar. C'mon they had pictures from the movie in the center! How cool was that? Well actually now I realize it wasn't that cool. But sometimes...well I did end up picking up that copy of Nick and Norah. And the pictures in the middle are very cute. To read more of my book musings click here. 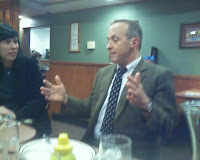 When I woke up on Monday morning, I had no idea that by the end of the night I would be eating at gay Denny's with David Sedaris. That particular Denny's is known as "gay Denny's" due to the fact that if you go there on the weekend at two in the morning, it's full of the most fabulous people in town. At 5:30p.m., Adam and I arrived at Abravanel Hall to help set up our spot where we were going to be selling books for the David Sedaris reading. We met up with Cat, Shari, and John and got everything ready for the 6:30 door opening. People slowly began to filter in, stopping by our little gift shop area just inside the door as the Hall employees were still trying to figure out how to set up the line for the table where Sedaris would be signing. One of the funny things about Sedaris is that he will just sort of quietly show up without notice. I was selling some books and I turned around and there he was. He sat at the table set up by the employees and began to sign some books before the reading. The lobby started to fill up as it got closer to "show time". Now, I had never been to Abravanel Hall before, so when I heard what sounded like a submarine preparing to submerge, I had no idea that it was a call for people to take their seats. Apparently, everyone in the lobby had no idea either, the beeping went pretty much unnoticed. People only began to go inside when someone got on the loudspeaker and announced that the reading would start in five minutes. I was pleasantly surprised when Cat handed Adam, John, and myself a ticket to go inside and watch. I wasn't sure if we'd actually be able to listen in on the reading, at best I thought we could take turns going inside, or maybe watch on a closed-circuit t.v. - which is what Shari and Cat did, but we got to sit in the front row. When he took the stage, Sedaris was met with wild applause as he stood shielding his eyes from the audience, asking the booth to turn down the house lights. The booth person complied and as the lights went down, he was visibly more comfortable, explaining, "I can do this just fine as long as I can't see you.". As he was reading from not only his new book, but an essay that didn't get published and a story from "Holidays on Ice", I thought about how much funnier these stories were because he was reading them. They're really funny on their own, but with his inflections and emphasis on certain words, and occasional pausing, it was so much funnier. I don't know how many times I had to catch my breath from laughing. About an hour and a half in, after reading some diary entries, he said "Thank you" in a way that made us think he was finished. The three of us made for the door to get back to the book selling area before the mass of people emerged from the auditorium, only to find that he wasn't, in fact, finished. Instead of going back inside, we stayed in the lobby and tried to listen on the closed-circuit t.v., which just wasn't the same. We only missed about fifteen to twenty minutes, I think, at the end. Then we were surrounded. It was a mad rush for books, and just as soon as it had begun, it was over. Everyone was in line for an autograph. And we waited. Every now and then, someone would come up to buy a book to read while waiting for someone who was in line, a line that went down a set of stairs and curved a little, but mostly we waited. It was midnight when the line was gone. 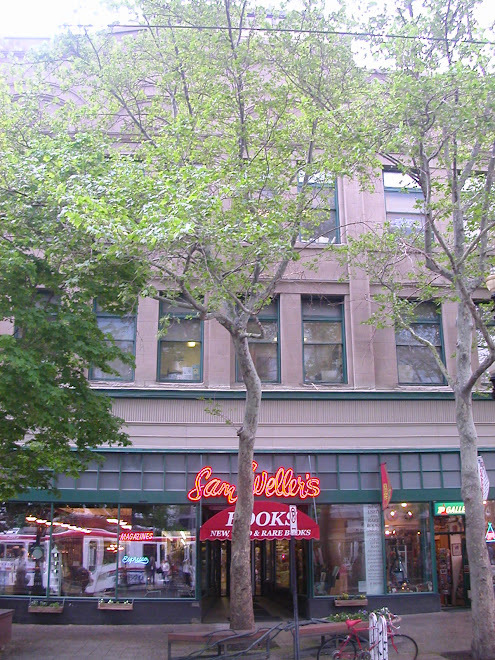 Sedaris walked over to us and signed a few store copies and our own books that we had brought for him to inscribe. None of us had eaten since lunch, so we decided to go to gay Denny's. Adam asked Sedaris if he wanted to join us, and I don't know if it was the intrigue of a gay Denny's, or just the fact that he too was probably really hungry, or a combination of the two, but he agreed to join us. We drove the books that we didn't sell back to the store and Cat went home. Shari, Adam, John, and I made our way to the gay Denny's, unsure if he really was going to join us. He did. If you're curious as to what David Sedaris ordered from Denny's, it was a Moons Over My Hammy with hash-browns, exactly what I had ordered. our gallery is off the wall! 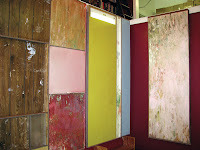 I am so tickled with our little-big sam weller's gallery on the mezzanine. 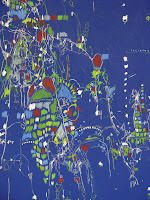 we have had some great art shows in the last year, and our latest -off the wall- definitely ranks high on the list. there is something to be said about bookstores and art spaces -as we've discovered in the past year, they have proved to be a dynamic match. gallery stroll was a lovely and buzzy evening altogether; we had a wonderful crowd and the exhibition was enjoyed by all. 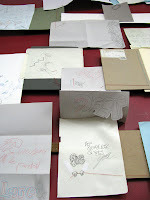 I've posted pics of gallery stroll night as well as documentation of the amazing works on display here. but I'd say to those who missed the opening, come down and check out the show in person, it is worth your while. 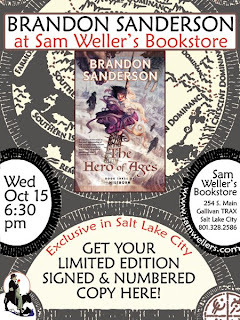 Up-and-coming world-class fantasy writer, Brandon Sanderson will be reading and signing from his latest installment of The Mistborn Trilogy: The Hero of the Ages (Tor, 2008) at 6:30 pm here at Sam Weller's Bookstore. The Hero of the Ages is the long awaited final book in this popular Trilogy and followed by Mistborn (Tor, 2006) and The Well of Ascension (Tor, 2007). Congratulations are in order as we know that Brandon Sanderson has also been chosen to finish the final novel in Robert Jordan's bestselling Wheel of Time fantasy series. Thanks to an upcoming event, two book clubs, and my own want to read something fun, I am currently trying to read four books. Usually it's a feat for me to finish just one book in a reasonable amount of time, but four? What have I gotten myself into? First, the event. David Sedaris is coming to Abravanel Hall on October 20th for his newest book, "When You are Engulfed in Flames". I am part of the little crew from our store working the event, so I am trying to finish that book by then. I'm not complaining, by any means. The man's a comic genius, the book is great. Next, book club one of two. The newest book club meeting at Sam Wellers is queereads, a book club focusing on LGBT literature. Created and moderated by Adam Streeter, the first book is Sarah Schulman's "Rat Bohemia" to be discussed on Wed. Oct. 22nd. Adam and I read this together in one night. It's a quick read and a great one. Even though this book was written thirteen years ago, I found myself relating to a character I didn't expect to, and reading about situations I've recently experienced. It was almost startling how familiar some of the emotions were. This book is a true gem written in beautifully simplistic, yet sometimes poetic prose. I'm really looking forward to discussing this at queereads. Now for book club two of two. Zach's book club, the Hardboiled Book Club, is reading Ryo Murakami's "In the Miso Soup" to be discussed on Tuesday Oct. 28th. I've only gotten about twenty or so pages into this one as of now, but so far, I like it. And because I like to torment myself, I'm reading an advanced reading copy of "Fool" the newest novel by Christopher Moore, due out in February of 2009. It's Moore's take on Shakespeare's "King Lear". I'm a little more than halfway through this and all I want to do is lock myself in a room with no distractions and finish it. I'm loving it. I was unable to find a picture of the cover. I'll post a review with a picture closer to the book's release. So right now, my reading schedule is like a juggling act, or perhaps something a little more scattered and inconsistent, say a really old intoxicated clown's version of a juggling act. october's gallery stroll will be Off the Wall..
We here curators of the Sam Weller's Gallery on the Mezzanine are thrilled to present the next art show to open next week on gallery stroll friday, october 17th 6-9pm. 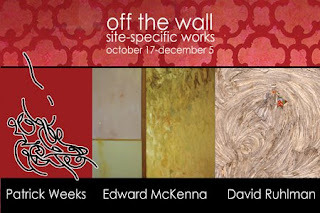 Off the Wall: site-specific works by Edward McKenna, David Ruhlman and Patrick Weeks. Each of these great artists (some of my personal favorites in the Salt Lake Art Scene) has explored the hidden spaces of the bookstore, and are working to bring the ghosts they have found into the light. If you've been to Weller's, you know our interior architecture is intriguingly labyrinthine. In our basement you find carry-over decor from the previous tenants of this old building: namely, a 70's night club which mirrored the columns, covered the walls in black velveteen and metallic red. There are many features to the bookstore that are not accessible to the public -hidden, a bit creepy, amazingly inspirational spaces which these three local artists have drawn from. It will be a wonderful show, and all salt lakers should be sure to attend!